WASHINGTON (AP) — President Donald Trump seemed gratified Thursday that his attorney general has endorsed a key talking point of the president’s supporters: that there was spying on Trump’s 2016 campaign. But Trump went a step beyond Attorney General William Barr, accusing the government of committing an illegal, unprecedented act. The president’s comments came a day after Barr testified at a congressional hearing that he believes “spying did occur” on the campaign, suggesting the origins of the Russia investigation that shadowed Trump’s presidency for nearly two years may have been mishandled. Barr provided no details about what “spying” may have taken place but appeared to be alluding to a surveillance warrant the FBI obtained on a former Trump associate. He later said during the hearing that he wasn’t sure there had been improper surveillance and wants to ensure all proper procedures were followed. 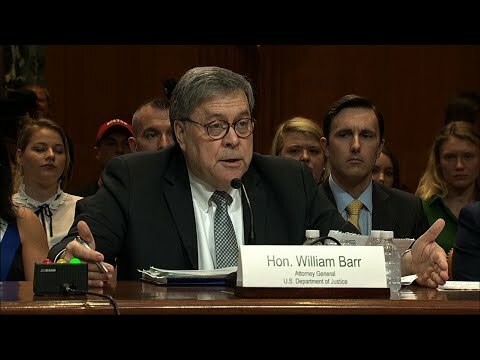 During Wednesday’s hearing before a Senate appropriations subcommittee, Barr said he was “not saying improper surveillance occurred” and was looking into the matter. Barr’s comments aligned him with the president and his supporters who insist his 2016 campaign was unfairly targeted by the FBI. They come at a time when Barr’s independence is under scrutiny from congressional Democrats as he prepares a redacted version of special counsel Robert Mueller’s report on the Russia investigation. Mueller concluded his investigation last month and submitted a nearly 400-page confidential report to Barr. Democrats strongly pushed back on Barr’s remarks. House Speaker Nancy Pelosi and Senate Democratic Leader Chuck Schumer, along with the top Democrat on the House and Senate intelligence panels, argued that Barr’s words undermined both his own credibility and that of the Justice Department. All four are on a panel known as the Gang of Eight that is regularly briefed on the most sensitive intelligence matters. While congressional Republicans have long questioned the origins of the Russia investigation, suggesting that Justice Department officials conspired against Trump, Democrats have argued it was legitimate. Barr has said he expects to release a redacted version of Mueller’s report next week. The Justice Department’s inspector general has been investigating the early days of the FBI’s Russia probe, but Barr has said he wants to pull together the different reviews underway and see if there are remaining questions that need to be addressed. Associated Press writers Darlene Superville, Eric Tucker, Mary Clare Jalonick and Alan Fram contributed to this report.